I’m a big fan of Richard Ayoade. Just from him being him. In life. So when he directs a film, I make it my business to go to a movie theater, buy a ticket, and enjoy some stimulating cinema for the afternoon/evening/what have you. Unfortunately, this has only happened twice, and we could use some further directorial projects (albeit, I’m not including the 10 music videos he’s directed, which are easily accessible with the internet and a fair few episodes of TV). It’s been a couple of years since the last one and I’m jonesing for a fix. In the meantime, I rewatched the movies we do have and was suffering from “having thoughts,” so I decided I’d type some of them up, hoping maybe that would give my brain a break. 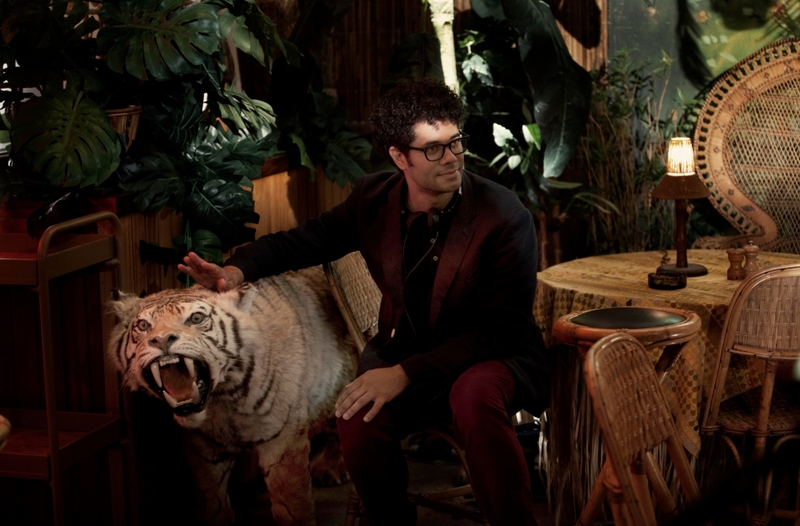 It’s no secret that Ayoade is a massive fan of the French New Wave movement of the 1960’s. His films manage to capture that tone while remaining fresh and contemporary. And any fan of French New Wave films should definitely give them a watch. But here’s the interesting bit: when looking at the two films as a directorial film oeuvre they’re startlingly different from each other and even seem to be striving to accomplish opposite goals. A lot of this has to do with the source material. His first film was based on a novel by Joe Dunthorne, while the second was based on a Dostoyevsky novel (on which he worked with co-writer Avi Korine). Still, it’s a wide gap for an individual to choose to mind. One thing that stands out in each film is the use of color, but the color schemes couldn’t be more different from each other. The colors in Submarine, his first film, are vibrant. Lots of deep blues as well as brilliant reds. The latter is the color I most associate with Submarine: red. It’s the color that represents Jordana, the protagonist’s love interest, and comes to define the entire film. My favorite example of this is Oliver’s outfit pictured here. He’s wearing a blue coat over a red sweater over a blue polo shirt. Blue is his color, red hers. It suggesets that she’s wrapped up in him. She’s not the first layer, nor is she the external layer, but somewhere in between. On the other hand, The Double, his second film, resides in a world of green. But not a strong substantial green, a sickly green. A possessed Reagan vomiting up pea soup sort of green. Everything within the world (from the clothes to the props to the sets) seems to fall within a certain color palette as well, all tans, awful greens, and unsightly yellows, with the occasional refreshing white or blue, colors that represent the protagonist’s love interest. The use of color has a very strong psychological effect on the viewer. Submarine feels open. The Double feels claustrophobic. Submarine almost seems to attempt to be breaking out of it’s world, splitting at the seams, and spilling into reality, while The Double feels like it’s magnetically pulling you in to a world too small and cramped, darkness seems to outline every frame. Submarine has bright roaming exteriors, The Double has almost no exterior scenes. And the few that exist make the world look like a foggy desolate wasteland of eternal night. There’s a fluidity to the landscape in Submarine, suggesting the connectedness of the characters, as well as their isolation. The Double separates the characters by filling the frame with literal physical lines, putting boxes around each of them. Then there’s the matter of the characters. Ayoade, in each case, chose to tell a story about a protagonist on the brink of unlikability. Submarine‘s Oliver Tate is a narcissist at the start, believing himself to be superior to his peers and only taking part in cruel games. While Oliver isn’t the school bully, he certainly bullies classmates, and he’s overly blunt and harsh when he speaks. So is his dream girl, Jordana, but at the point when she becomes vulnerable, Oliver panics, fearing his own vulnerability. He isn’t comfortable enough to confide in her about his own worries regarding his family, and essentially smashes the relationship up. But he’s a teenage boy, and certain things about his character feel relatable: he has a crush on a classmate, fears his parents might get divorced, and is trying to figure out who he is. He’s one of the ultimate coming-of-age characters. How many of us would look back at our younger selves and cringe at so many missteps, and ridiculous phases? His story is about making mistakes, recognizing them, and then fixing them, or at least setting out to fix them. In the beginning of the film, he perceives all the other characters as a supporting cast in the story of his life. By the end, he comes to realize that they have an existence independent of him, and he can’t manipulate the world to do his will. It shakes up his reality, but ultimately changes him into a better person. And when his attitude toward the people around him changes, their attitudes about him change too. His parents open up to him about their relationship (they may take this a tad too far), Oliver discovers that his father is suffering from depression, and Oliver realizes that if his only hope of having a happy future with Jordana is to actually talk to her, hear her side of the story, not just run away when he’s uncomfortable. The Double‘s Simon James is an awkward pushover stuck in a rut, who likes to spy on his female neighbor, Hannah. He knows, in part, what he wants, but never does anything about it. He also has moments of likability, but his universe is so removed from reality, that he isn’t as relatable. That being said, there is a more relatable character in Hannah, for the simple reason that when Simon is doing his uber creepy spying on her, she does those simple strange things that we (I assume) all do when we’re alone: wandering around her room, playing with the blinds, ripping up paper, sticking it to her fingers. In a way, I think that’s part of Simon’s infatuation with her. He’s too awkward to be natural even when he’s alone. His titular double, James Simon, is everything Simon James wants to be. For that very reason they can’t both exist happily at the same time. They’d be the same person. Simon can’t attain the happiness he craves as long as James exists. James appears to be an ally, helping Simon with his personal life, in exchange for Simon helping James at work. At first. Then James reveals himself to be more diabolical. And further confusion is caused by Simon having agreed early on for the two to occasionally pretend to be each other. This is made even worse by the other characters only seeming to think Simon is James when James wants them to. By the end, Simon, partially on purpose, partially by accident, ends up switching his and James’ roles with potentially fatal effects. Is he still the hero? Has he become the villain? It’s hard to say. The ambiguous ending is also an aspect of each film. But the endings themselves are very different from each other. Submarine ends with Jordana walking further and further into the ocean, pausing after each step to see if Oliver will follow her. And each time he does. At this point, the two aren’t a couple, but there seems to be a possibility that they’ll reunite, more mature and understanding. The end of The Double is a little more unsettling. Is it positive that Simon seems to be becoming James, considering James’ near psychopathic actions? Simon doesn’t seem that awful at the end of the film, but James didn’t seem that awful at the beginning. Is he stuck in a Simon-James loop, doomed to forever cycle between the two? Does James exist? Is Simon Fight-Clubbing? Does he have multiple personalities? Or has he just found some of that confidence he was lacking to improve his work situation and effectively communicate with Hannah? In actuality, the ending is whatever you want it be, but the possibilities that you have to choose from seem infinite. Basically this is an incredibly long winded way of saying that despite sharing a writer/director they’re incredibly different from each other, and neither is better than the other. My personal preference, in case your curious, is Submarine. The idea of seeing your own life as a film, where you’re trying so hard to control everything, and feel that, as the protagonist, you must drive all the action in he movie of you forward, really hit home for me. Life will move along at the same clip it always has. That’s okay. Certain things will work out the way you want them to and others won’t. Sometimes we need that little reminder: Oh. No. Life is not a movie about us. Movies are just some of the lovely things we fill them with. This entry was posted in film and tagged art, British film, cinema, color, coming of age, craig roberts, dark comedy, Dostoyevsky, dramedy, Dunthorne, film, foreign film, French New Wave, Hannah, James, Jesse Eisenberg, Jordana, light, Mia Wasikowska, Oliver, Richard Ayoade, Simon, submarine, The Double, yasmin paige. Bookmark the permalink.